Color. Mountain Scenery. Reflection. Gold. Sculpture. Layering. Painting. Light. Clay. Nuggets. Timelessness. Landscapes. Carving. Visual Experience. Ancient Techniques. Earth. Textures. These all describe the innovative and remarkable jewelry collection of Wolfgang Vaatz. Tell me about your winning collection. The Rocky Mountain Collection goes back to my original art work, painting and sculpture, which always took inspiration from natural landscapes. When I started working on landscapes in jewelry, I was particularly inspired by a sunset on the California coast. A big part of my art has been experimenting—making clay sculptures “natural englobes and glazes” or experimenting with earthen material found from the place that inspired the painting. My experience with clay and painting in layering of materials and using the ancient sgraffito technique (for example in clay, when layers of different colored slip are spread on top of each other and then scratched away to get back to the clay underneath). I use a similar process in this collection by applying metal layers and adjusted techniques by physically removing the unwanted metal. Black lines and areas develop by oxidizing the exposed silver. As a painter, I tried to avoid glare and reflection on the painting, so the color can radiate. However, in jewelry, I welcome reflection and glare, which gives the metal color and shades and also highlights the texture. 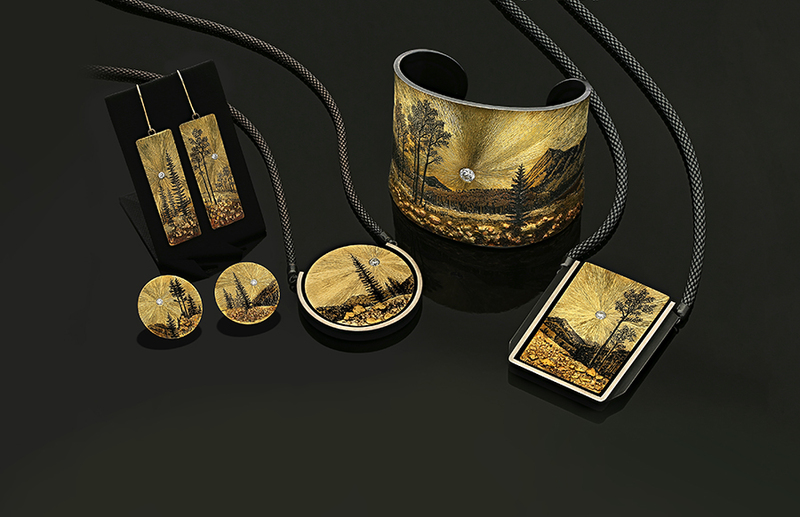 All the pieces are inspired by visiting and exploring the Rocky Mountains. Visual experiences, which stay in my memory or intrigue me onsite for sketches and photos, find their way into the art pieces. What was your goal with this collection? To connect the wearer/viewer to the place of inspiration. I like to share this experience in nature with the wearer and want them to feel like a part of it as well—as if he or she is walking with me into the scenery. Also, to create a collection with a wide price range so that financially different demographic groups can obtain an original piece of art. What were the materials used in the collection? As I mentioned, I built up layers of metal including sterling silver, 18K gold, 14K yellow for a lighter color and unrefined gold nuggets for the rocks. For the browns, I use 14K and 18K rose gold. I play with different temperatures on the metal. Diamonds are also used in the pieces, as well as some platinum. I live in southeastern Arizona, about an hour south of Tucson. It is an area that is not a typical Arizona landscape. It’s more like central California with oak trees, grass plains and mountains, but it also resembles the African bushland with nice size mesquite trees. I got into jewelry about eight years ago when I helped my daughter, who had discovered beading. When I accompanied her to the Tucson gem show to look for beads, we also saw minerals and jewelry. I fell in love with the beauty of the minerals because they were small sculptures. My childhood fascination of minerals and rocks rekindled. I was disappointed in the jewelry industry because most jewelry and stones often looked the same. I bought some roughs and used my sculpting tools to cut stones, which I wouldn’t recommend to anyone. Cutting stones and making jewelry started as a hobby. I knew about welding from building kilns for my clay/stoneware sculptures, but I had to learn to solder, which is as far as my formal jewelry training goes. In the beginning, I had lots of encouragement and advice from people I talked and listened to. I am basically self-taught. I just had to get used to working on a much smaller scale. No one. I have done it all myself. Caspar David Friedrich, a 19th century German painter, was someone I always admired. Also William Turner, an English painter, and Monet are examples of admiration. I constantly have new ideas. All sorts of things make me think about art and design. When I am in a deep sleep, that is the only time I don’t create. If I am trying to solve a problem, sometimes I wake up in the morning and there is the solution. “Earth Terra Erde Inc.” All three words mean “earth” in different languages to emphasize that all my art is inspired by our natural world with little or no human interference. The idea also came from having lived in different countries and speaking different languages. However, my url is www.wolfgangvaatz.com. I strive to translate experiences I have had within the natural landscape into my art work. With my background, I use a more experimental approach when creating jewelry, combining different metals and shapes while adjusting the technique to match the material. I play with asymmetry in my jewelry, though having a well-balanced composition and emphasis on a sculptural, painterly look and textural feel are important. Each piece is created to engage the wearer and the viewer in a dialogue. To me, it is satisfying to make jewelry that is functional and wears well on the body and have clients comment how much they love to wear their pieces. I have work exhibited and sold in fine art galleries as well as jewelry galleries. I participate in art and trade shows. I don’t like to work with rose gold, but I love the color. I am very comfortable working with Argentium®. If you understand the material you are working with, you ‘enter into a dialogue’ and your results can stretch the boundaries. And the gold nuggets! I love them! They are fascinating. It is amazing what you can discover in a nugget. I have a collection of weirdly shaped nuggets. Nature has preserved these tiny objects. I have a different background. That makes a difference. I certainly don’t think about fashion because my work comes from my own deeply personal experiences. All designs can be traced to what I have discovered exploring the natural environment. I can’t compare myself with other jewelers. My pieces are little paintings or sculptures. I feel this is my differentiator. Jewelry is a very personal object. The jewelry pieces I make are very personal. They tell a story. I love to get to know what clients say and feel about the pieces I create. No - the jewelry is timeless. Create where your heart is. Bringing together techniques that are not meant for jewelry into jewelry. And I didn’t think I could paint without paint; here I can “paint with light,” reflecting from the metal and gemstones. Michael Zobel, that would be something wonderful. I know Bernd and Tom Munsteiner, whom I admire for their ground-breaking, innovative gemstone cuttings. The Munsteiners and Zobel have brought, to a very traditional industry, a new approach and philosophy. I was surprised yet not surprised, honored – just happy because this collection reflects my artistic past, at the same time it’s current with my body of work. Why did you want to enter the Saul Bell again? Having been second two years ago and having been able to attend the Santa Fe Symposium gave me more technical/scientific information for approaching metal. Some of that information influenced my own technical approach. I like to share the result. Also, the winning piece two years ago was not a typical design of my work. The main reason for entering again was that this collection reflects far more my overall design philosophy.